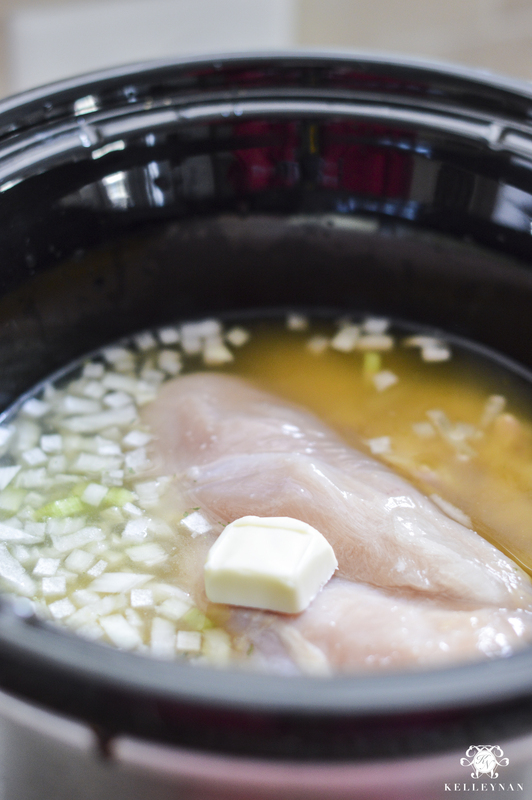 Winter is the time for cleaning out, organizing, and purging our homes, but it’s also the perfect time for rib stickin’ comfort food and crock pot meals. 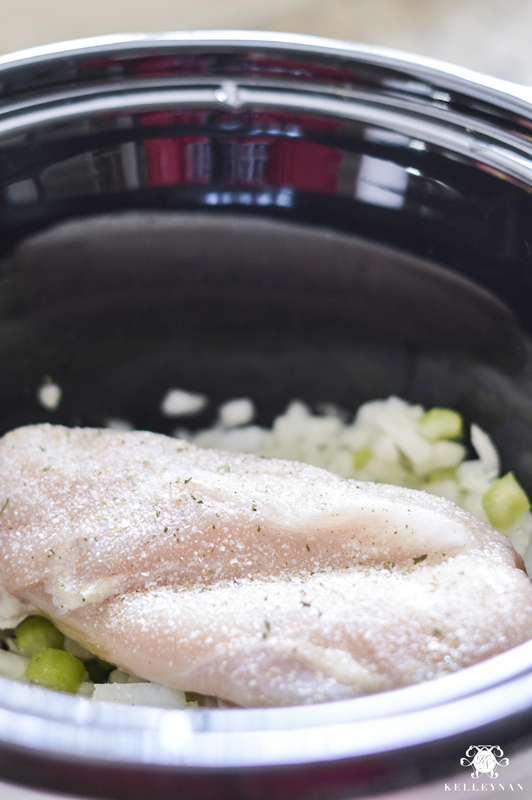 Our slow cooker is getting a serious workout lately because starting something yummy in the morning and then getting on with my house projects has become a regular part of my schedule. 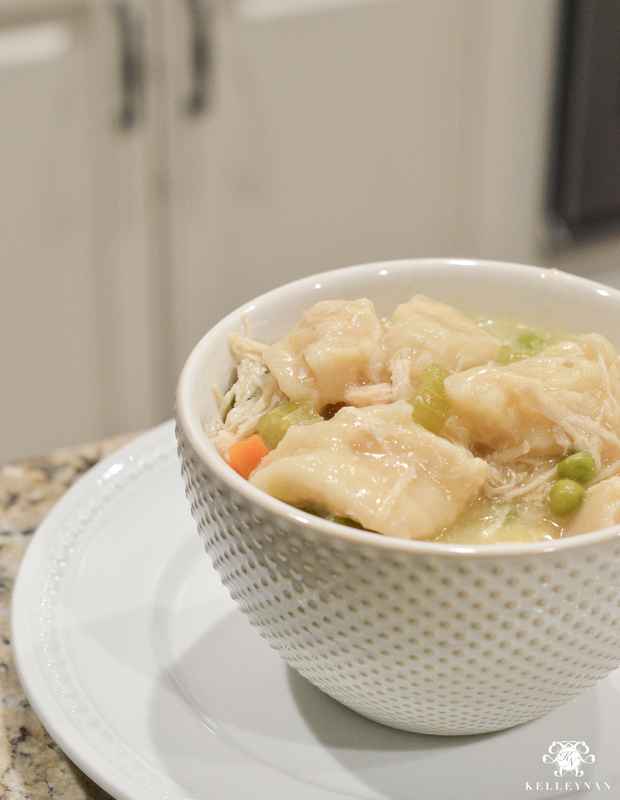 Last weekend, my husband made a special request during our first snow – one of our favorite, filling, comforting cold weather dinners- crock pot chicken n’ dumplings. I don’t make dumplings from scratch- heck, I don’t even thaw the chicken first. It is seriously the most simple, delicious winter meal ever! 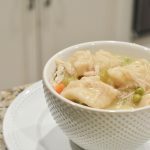 Read on for the easiest crock pot chicken n’ dumplings recipe with an organized kitchen junk drawer I tackled while waiting out the dumplings. 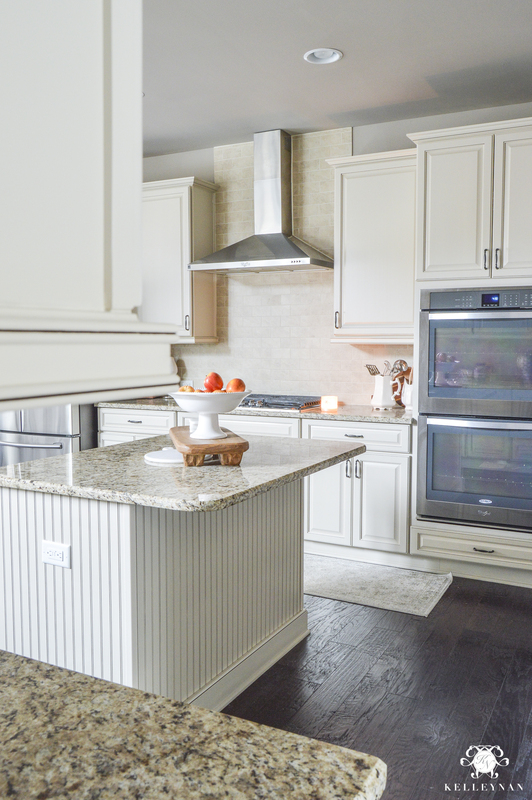 Before I even started throwing the ingredients in the crock pot, I tidied the kitchen. 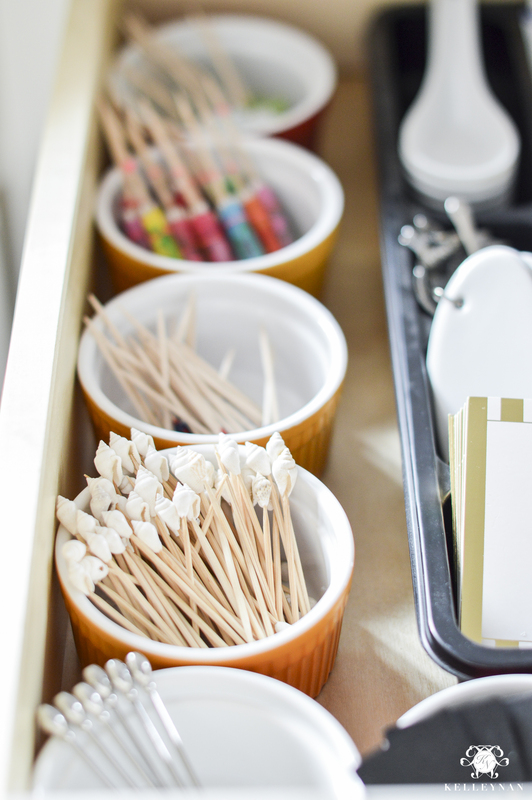 Taking a few minutes to start with a clean, fresh palette makes a huge difference! Then, I set to work. 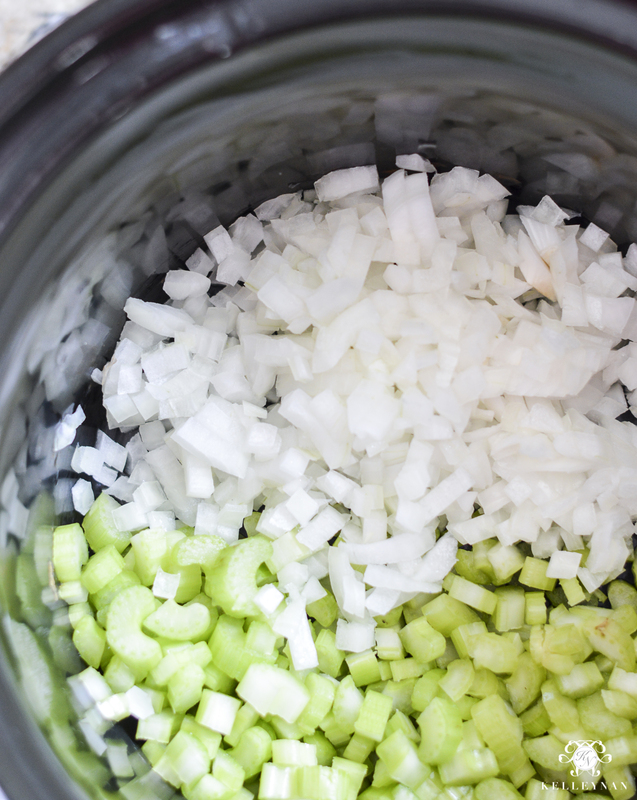 Place diced celery and onion to the bottom of the crock pot. Add chicken breasts on top of celery and onion. Sprinkle garlic salt on chicken breasts. Add butter on top and sprinkle pepper. After 6 hours, chicken should be tender. Use a sturdy spatula/spoon to shred chicken. It should fall apart when you press on it. Continue until all chicken is shredded. 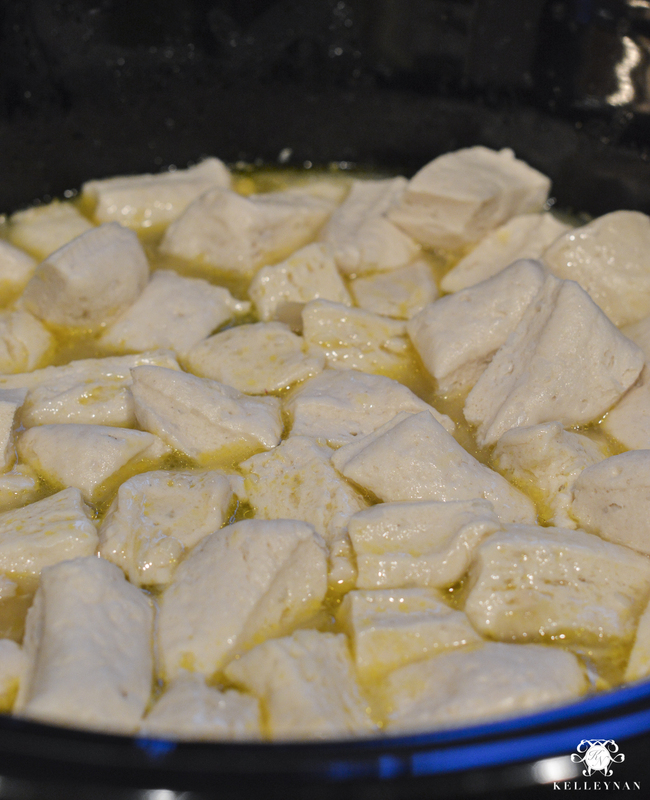 If the broth needs to be thickened (it usually does), add a little cornstarch/water mixture to thicken a bit. 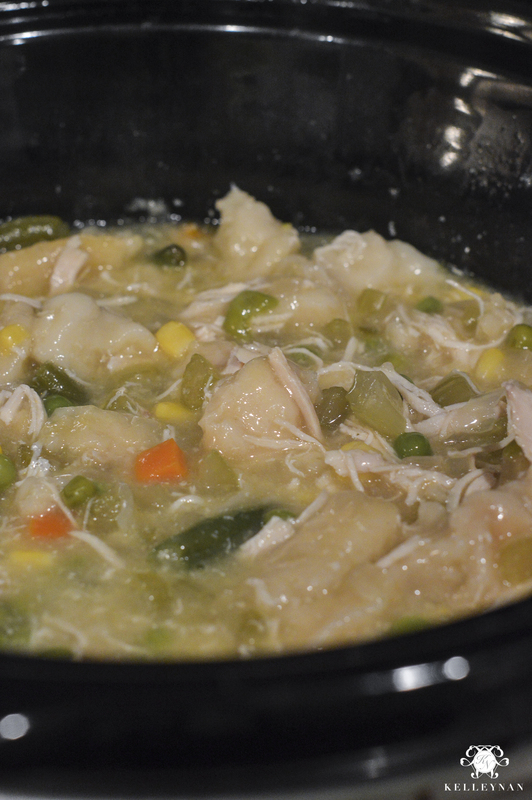 If you are adding mixed vegetables, go ahead and add to the pot. Take biscuits and cut into small squares (3-4 cuts across and once down the middle). Add to the pot and mash them down just enough to moisten the top of the dough. OPTIONAL- save a couple biscuits to cook on the side to eat with the meal. Cook on HIGH for 1.5-2 hours. Check the center of one of the biscuit dumplings to ensure they are cooked all the way through. Stir the pot and serve. This is the result of six biscuits, cut into small chunks. After an hour and a half, check your dumplings. Once they are cooked through, you are ready! 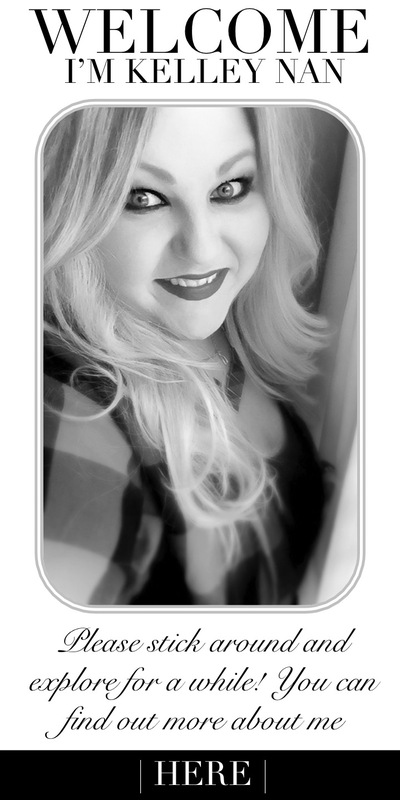 While I was waiting out the dumplings, I scanned around my kitchen. Several cabinets and drawers need serious work but there was one drawer in particular that needed a makeover- the “everything” drawer. 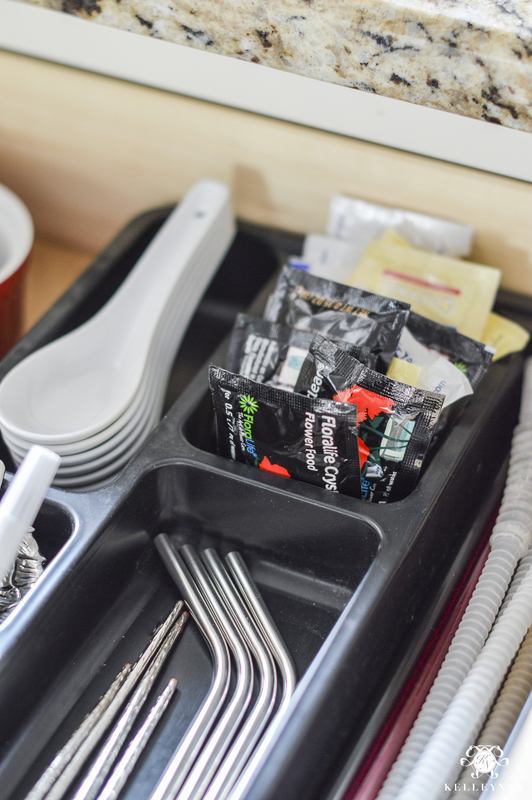 It was filled with straws, leftover condiments, napkins, takeout menus, flower food… a little bit of everything. 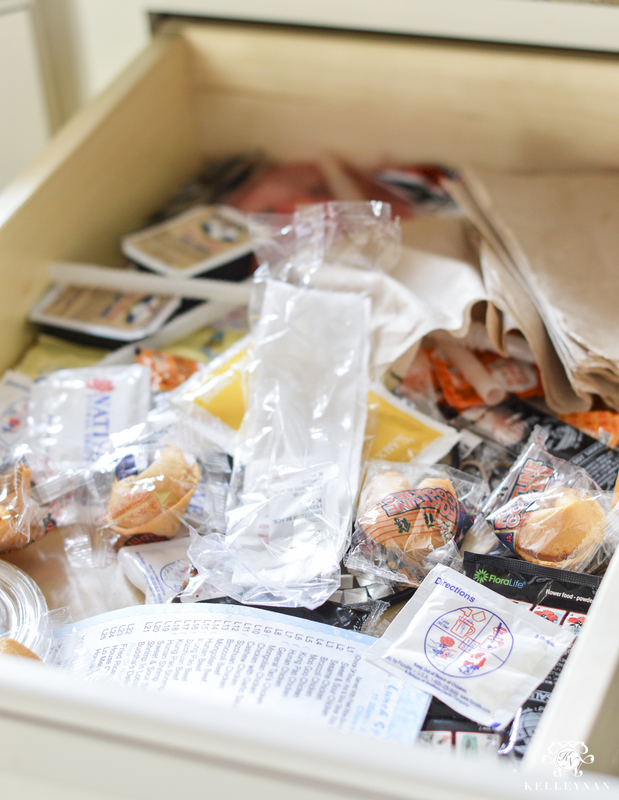 Meanwhile, my drawers in the butler’s pantry hold far too many items. I easily distributed some items to more suitable homes and dumped the rest. Hello- open honey mustard packs that were spilled out into the drawer?! 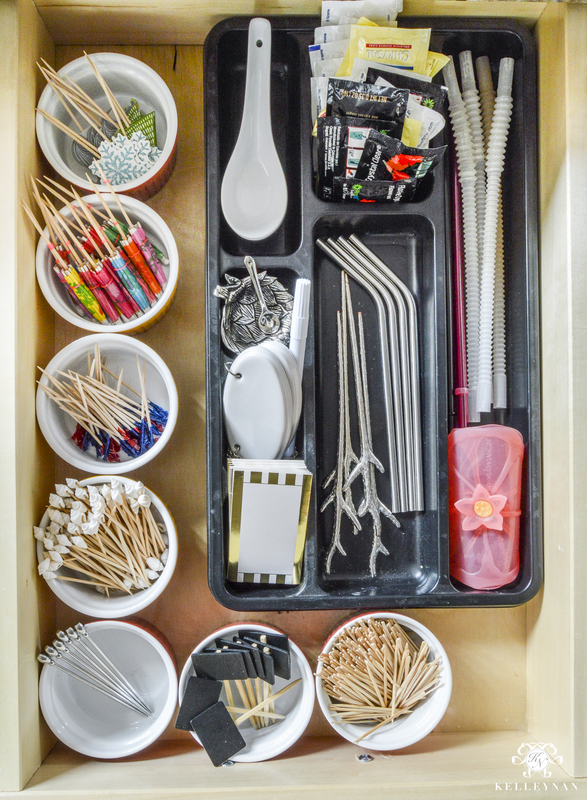 This was a spur of the moment project so I took inventory of organizational containers I already had. We are ALL about small bowls and ramekins in our house. As in, we have a cabinet overflowing with them. Several have sat unused and seemed the perfect solution for the also obscene amount of picks I have accumulated. 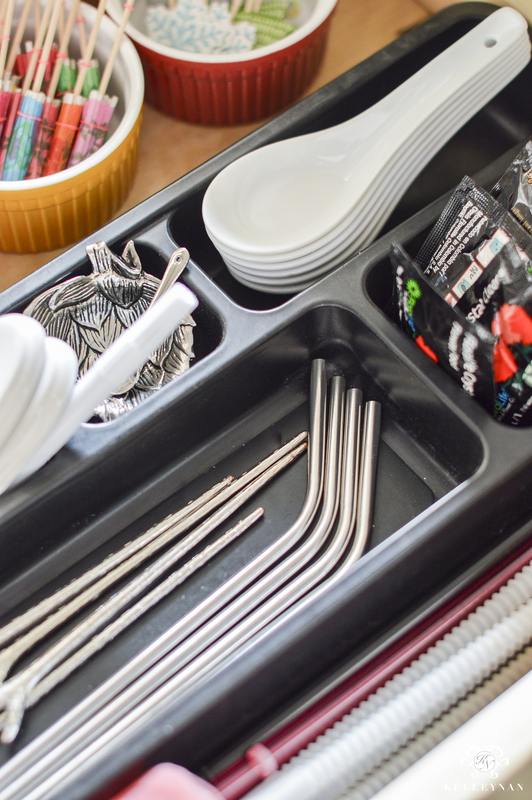 I had an unused, plastic organizer thrown in a closet that I pulled out to corral other entertaining items, straws, and flower food. This was accomplished so quickly while dinner was finishing, the rest of my kitchen organization will be tackled in a similar manner, dinner by dinner, space by space. Bree, you must! So easy and so yummy! This sounds delicious. I’ve just bought a Crock Pot so I’m really excited to start slow cooking. I’ll be giving this a go for sure! Victoria, so yummy and easy! Let me know when you try it! This recipe sounded wonderful so I made it today. It was amazing! My husband and I loved it and look forward to making it often. Thank you so much!! This was seriously good and hearty and oh my gosh was it easy! I like the carrots but no peas. Kelly, can I use non frozen chicken and turn heat to high? Modifying the instructions a little. I am using a cast iron dutch oven, in the oven. I am so excited. Hopefully I can shorten the cook time a little. I usually make my own dumplings so using biscuits will be interesting. My 3 yr old chowed down on the celery while I was cutting it up. I’m so excited!